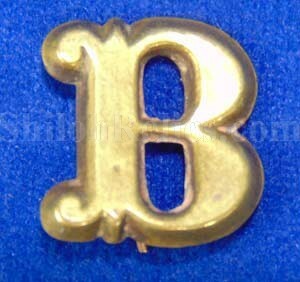 Small "Zouave Style" Civil War Stamped Hat Insignia Letter "B"
This is an excellent small size hat letter "B". It is made of stamped brass and is the style that you occasionally see on officer and militia style headgear pieces of the Civil War era. This pattern is illustrated in the 1864 catalog of the famous Schuyler, Hartley & Graham Company of New York. They are often referred to as a "Zouave Style" insignia. It only measures 3/4/ths inches by 5/8ths inches in overall size. 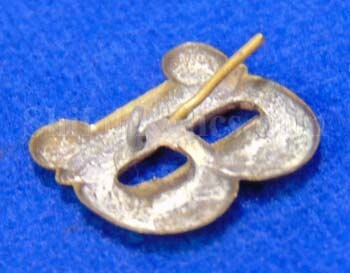 It has 1-1/2 of the 2 original attachment pins remaining on the reverse. 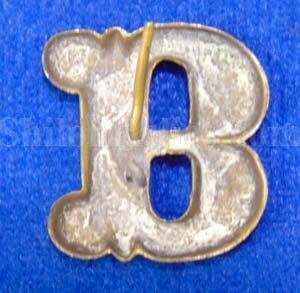 This will make a very nice and affordable addition to any Civil War era hat letter insignia collection.